Hain Celestial Gives Rice Dream Easy-Open Top – StratGo Marketing. Plug-in marketing department services. 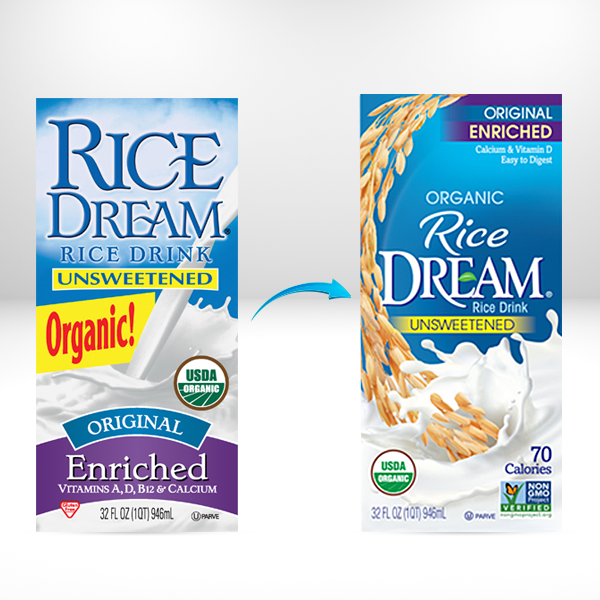 Consumers of Rice Dream rice drink can now prepare their morning cereal faster thanks to a new packaging innovation. Credit: The Hain Celestial Group, Inc. The Hain Celestial marketing team is phasing-in a new, easy-to-open screw cap atop its familiar Tetra Pak carton. Offering this consumer benefit continues a trend of making the pour easier, although it’s been quite some time since the last update (pull-off foil strip) was incorporated. Anyone who’s ever had a pull-strip malfunction, which then required puncturing the seal with sharp or blunt force, will appreciate the new closure. More good news for shoppers: the new convenience feature appears to have been incorporated within the brand’s existing price structure, as retail pricing is unchanged at present. That’s a worthy accomplishment, since the screw cap would seem to cost more than the foil strip. Give credit to what was likely a productive collaboration between marketing, manufacturing, finance and packaging engineers. Let’s see if other players in the shelf-stable non-dairy category such as Almond Breeze, WhiteWave’s Silk, and private label copy the packaging change. That often happens. Along with the screw cap, Hain has updated the graphics for all its Dream brand non-dairy products to streamline and better organize the consumer presentation. Hain marketers have a good handle on package redesign, as I previously noted when commenting on the refresh of the Arrowhead Mills cereal product line. Look for packaging opportunities to deliver consumer benefits and revitalize brand concepts. Make it happen by including packaging considerations within all strategy and brand planning. A good example is the new easy-open, easy pour screw cap on Hain Celestial’s Dream brand non-dairy products. I agree with the other commenter! I searched for this because I was going to return my “open” rice dream. I kept thinking it had been opened and was worried it was contaminated. When I first opened it, there was no clicking or seal that showed it was previously sealed. It just opened as if someone else already undid the seal. I won’t be buying it again as it doesn’t seem secure. Thanks for reading. I’m not affiliated with Hain Celestial/Rice Dream. You may want to send any product comments to them. I kept thinking the seal was broken, so i kept returning them. Not all the boxes say it has this easy open feature… plus just cause i’m lactose intolerant doesn’t mean i’m a geriatric old lady who cant open a foil seal. Personally id rather break my own seal. Now its hard to tell if the product has been previously opened before purchase. Not sure i like this.